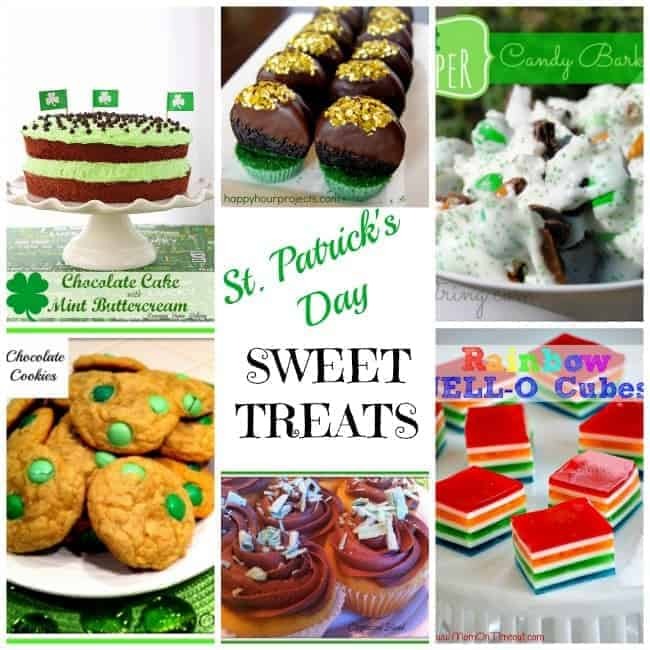 These Rainbow Treat toppers are a fun and simple way to celebrate St. Patrick’s Day with family, friends, neighbors or coworkers. 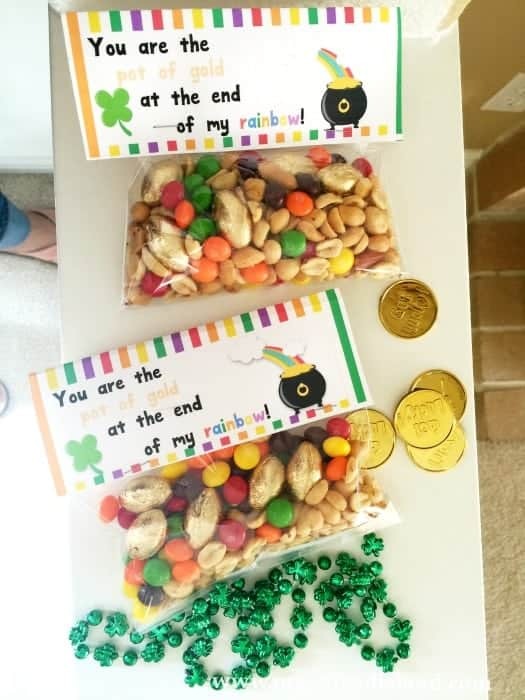 All you need is some candy or nuts or popcorn and little bags to make these fun little treat bags. 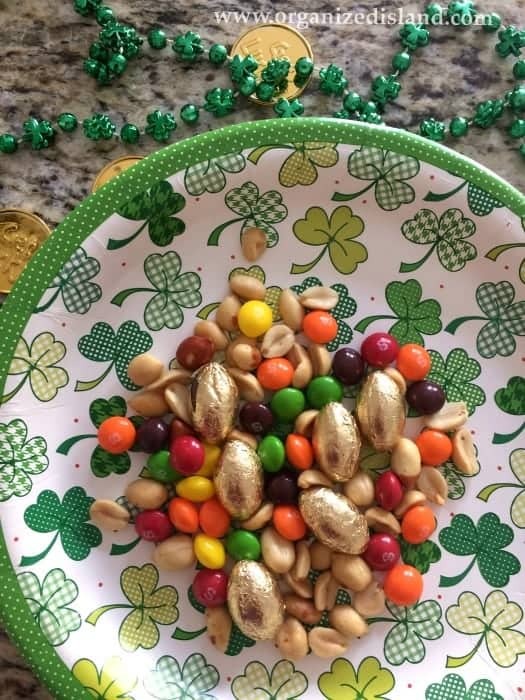 I am also sharing my rainbow trail mix recipe for a fun celebration or lunch box treat. 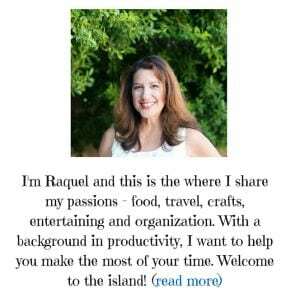 Cute for friends and coworkers too, because we all need a little more love and happiness! 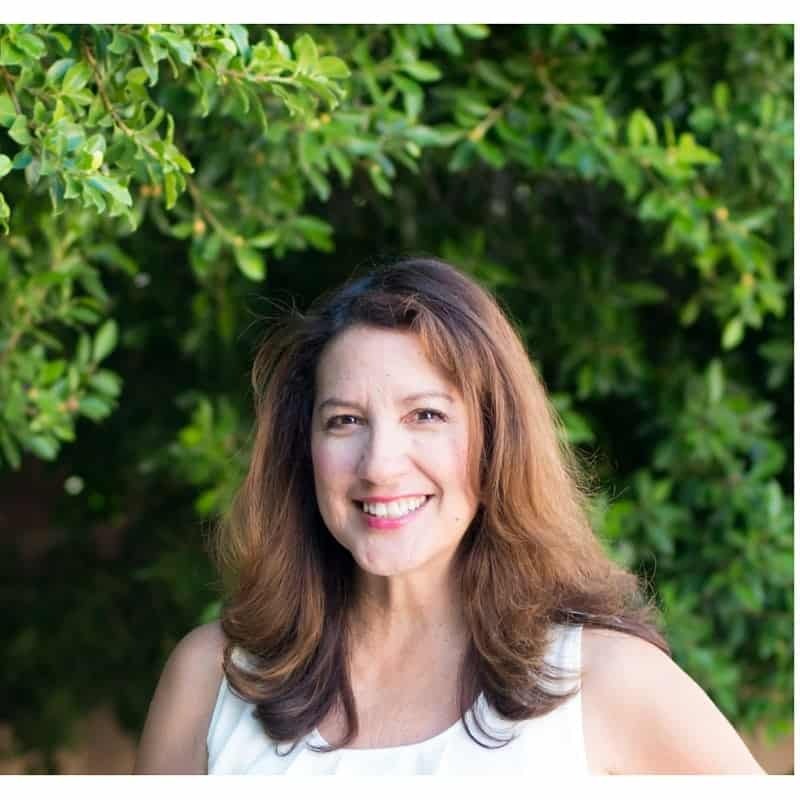 I am always looking for ways to celebrate the small moments in life and this is a fun and quick way to bring a smile to someone’s face. It really brings me joy when I can make someone’s day a little better. I also love that these do not make much time to put together. 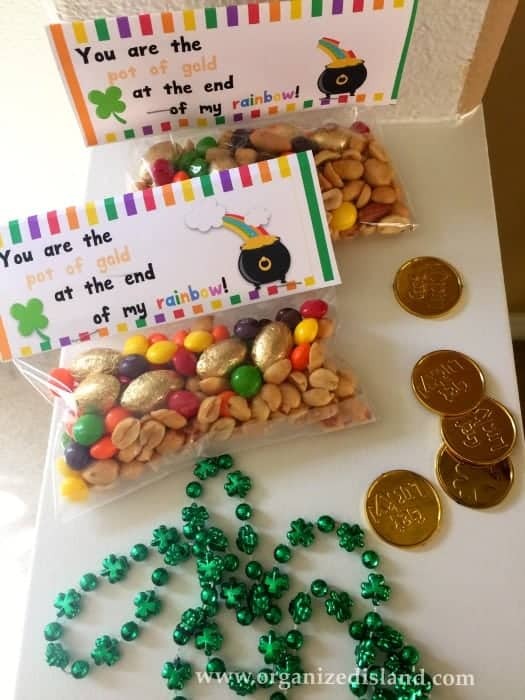 I filled them with trail mix, but you can also fill them with candies, popcorn or shamrock cookies! St. Patrick’s Day is something I look forward to because the first day of spring is just a few days away! Spring makes me think of longer days, wearing shorts and dresses and enjoying the flowers, although sometimes they do make my hay fever flare up, but it is worth it. Mix above ingredients in a bowl. Makes 1 1/4 cups. I am including these fun St. Patrick’s Day bag toppers that you can download and print for free! 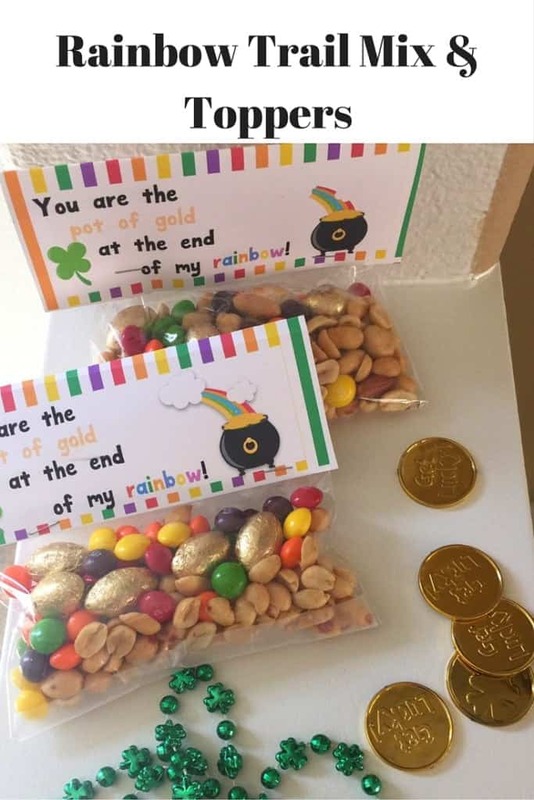 The great part is you can substitute the nuts with popcorn and can also use chocolate gold coins to make this a fun and festive treat. It one of the simple ways to celebrate St. Patrick’s Day! 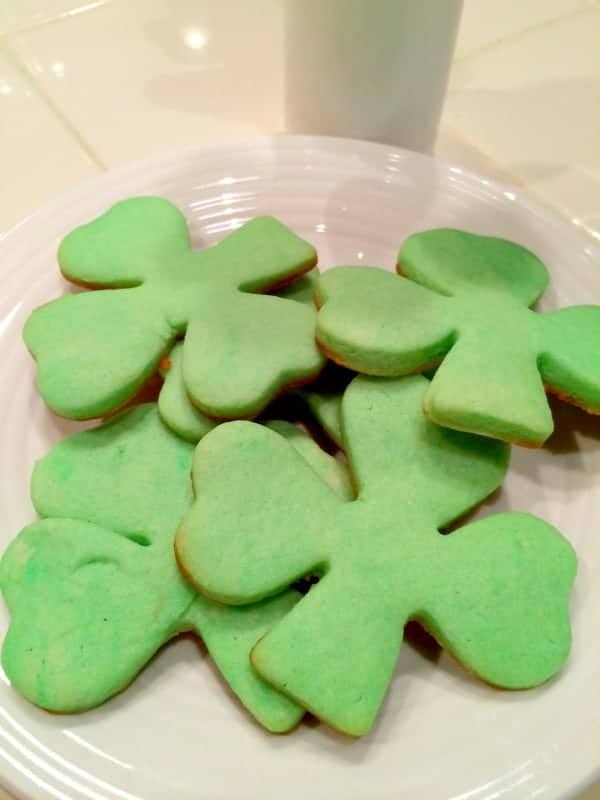 Get your free St. Patrick’s Snack Toppers here! Those treat bags are so sweet! I feel the same way. We are not even a little Irish but I love this holiday. I love the proximity to Daylight Savings and spring. New England has rough winters. Even when they’re very mild, they’re still rough because they’re dark and cold. And I love corned beef and little traits like this. I love corned beef too Tamara! I have heard it has been especially cold where you are lately. I hope it warms up for you soon! Love the bags and the trail mix looks delicious!